It can be Oktoberfest in the winter, right? 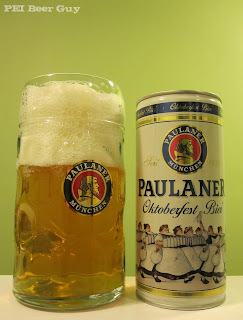 I got this 1L can of Paulaner Oktoberfest-Märzen for Christmas, along with its mug. The beer is exactly what you'd expect - clear, golden, a few bubbles rising in the mug. The head was much taller than expected - pillowy, soapy, and off-white, leaving wee patches of lacing on the way down. It smells more like a European lager - an adjunct one, at that. It doesn't smell as cheap / poor as some - it comes off as fairly refreshing (but relatively plain). Some aromas of pilsner or noble hops. Taste has some light caramel and spice. It's got more to it... it's fuller than it looks or smells. There's something lightly fruity about it too, as it warms / nears its end. Despite its light body, it's actually quite smooth. The carb's fairly light. I feel like I should be in a beer garden somewhere with buxom yet burly lasses somehow managing to carry several of these in one hand. Akin to the singing of the Whos in Whoville, this beer started in low then started to grow... on me. A smooth, enjoyable brew. Can't wait to whip the mug out next fall! You'll enjoy that mug ever more when it's filled with Märzenpant II next Fall.